A starts crossing the plot diagonally. After walking half the distance, he turns right, walks some distance and turns left. Which direction is A facing now ? From the original position, B and D move one and a half length of sides clockwise and anti-clockwise respectively. Which one of the following statements is true ? B and D are both at the mid point between A and C.
B is at the midpoint between A and C, and D is at the corner originally occupied by A. D is at the midpoint between A and C, and B is at the corner originally occupied by C.
B and D are both at the midpoint between A and D.
From the positions in the original figure. C and A move diagonally to opposite corners and then one side each clockwise and anti-clockwise respectively. B and D move two sides each clockwise and anti-clockwise respectively. Where is A now ? After the movements given in the above question, who is at the north-west corner ? Directions (Q. 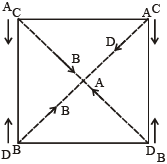 6-7) : A position of four policemen A, B, C and D in a circular park which is divided into sixteen plots is shown. P, Q, R and S are the offenders whom they have to catch after given moves. The figure shows their positions. 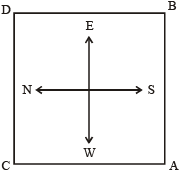 Note that the by-lanes are North-South and East-West.Who two are positioned North-West, South-East ? A is positioned north-west and P is positioned south-east. P, Q, R and S are the offenders whom they have to catch after given moves. The figure shows their positions. Note that the by-lanes are North-South and East-West.If A, B, C and D were to move clockwise four plots and P, Q, R and S were to move anti-clockwise six plots, then who two would be the north-south ? Clearly, the distance between e and g is 2 km. From the above diagram, the distance between a and f is 1 km. Clearly, the distance between e and i is 1 km. Directions (Q. 11-12) : Point B is 12 meters south of point A. Point C is 24 meters east of point B. Point D is 8 meters south of point C. Point D is 12 meters east of point E and point F is 8 meters north of point E.If a man has to travel to point E from Point A (through these points by the shortest distance), which of the following points will he pass through first ? Directions (Q. 11-12) : Point B is 12 meters south of point A. Point C is 24 meters east of point B. 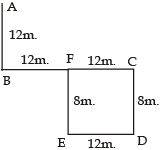 Point D is 8 meters south of point C. Point D is 12 meters east of point E and point F is 8 meters north of point E.If a man is standing facing north at point C, how far and in which direction is point F ? Directions (Q. 13-14) : Point D is 14 m towards the West of point A. Point B is 4 m towards the South of point D. Point F is 9 m towards the South of point D. Point E is 7 m towards the East of point B. Point C is 4 m towards the North of point E. Point G is 4 m towards the South of point A.Which of the following points are in a straight line ? Points B, E, G and A, C, D are in a straight line. Directions (Q. 13-14) : Point D is 14 m towards the West of point A. Point B is 4 m towards the South of point D. Point F is 9 m towards the South of point D. Point E is 7 m towards the East of point B. 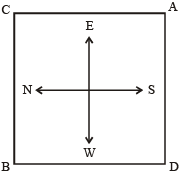 Point C is 4 m towards the North of point E. Point G is 4 m towards the South of point A.A is in which direction with respect to C ? 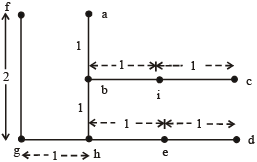 A is towards East of C.
Directions (Q. 15-17) : Farmer Batuk Singh has a larger square field divided into nine smaller square fields, all equal, arranged in three rows of three fields each. One side of the fields runs exactly east-west. The middle square must be planted with rice because it is wet. The wheat and barley should be continuous so that they can be harvested all at once by the mechanical harvester. Two of the field should be planted with soyabeans. The north westernmost field should be planted with peanuts and the southern third of the field is suitable only for vegetables.If Batuk Singh decides to plant the wheat next to the peanuts, in which square will the barley be ? The square immediately north of the rice. The square immediately east of the rice. The square immediately west of the rice. The square immediately north east of the rice. Since Wheat and Barley should be continuous, therefore, Barley will be planted in the square immediately north east of the rice field. Directions (Q. 15-17) : Farmer Batuk Singh has a larger square field divided into nine smaller square fields, all equal, arranged in three rows of three fields each. One side of the fields runs exactly east-west. The middle square must be planted with rice because it is wet. The wheat and barley should be continuous so that they can be harvested all at once by the mechanical harvester. Two of the field should be planted with soyabeans. The north westernmost field should be planted with peanuts and the southern third of the field is suitable only for vegetables.Which square cannot be planted with wheat ? The square immediately west of the rice field cannot be planted with wheat. Directions (Q. 15-17) : Farmer Batuk Singh has a larger square field divided into nine smaller square fields, all equal, arranged in three rows of three fields each. One side of the fields runs exactly east-west. The middle square must be planted with rice because it is wet. The wheat and barley should be continuous so that they can be harvested all at once by the mechanical harvester. Two of the field should be planted with soyabeans. The north westernmost field should be planted with peanuts and the southern third of the field is suitable only for vegetables.Which square cannot be planted with soyabeans? The square immediately north east of the rice square cannot be planted with soyabeans.